- a brainstorming meeting with a number film funds (SFI, NFI, Croatian Audiovisual Centre, Eurimages) and other supportive parties (SIFF, Meetings on the bridge, etc. ), and CIMA (Spanish network of audiovisual sector professionals & founder of/partner to EWA Network) at the Scandinavian Terrace on Monday 20 May; Thanks to the Norwegian Film Institute, EWA Network was able to organise this meeting early on Monday morning (!) to discuss training, fund-raising and other issues. While we can’t divulge too much at this stage we can share that a number of targeted e-learning recordings on a limited number of specific subject areas will be devised over the coming months and we will also be developing some specific initiatives which will take place at festivals, including “inspiration” talks and “speed meetings”. EWA Network will also be present at the Stockholm International Film Festival event in November as well as at a number of other events. We will be sharing the calendar with you shortly. EWA was only able to organise these events with the help of a team of volunteers, including Justin John, Aurélie Grenet, Ania Paluch, Nicholas David Mackenzie, Swedish director Björn Tobiasson and Dylan Thomson and the photographer Alenka Slavinec without whose help the events would not have been able to take place. We would also like to thank Freixenet for sponsoring the happy hour, Lio de Faldas for sponsoring clothes worn by Alexia Muiños Ruiz and France Raveney, MyHair, Barcelona, and Serena Whitehaven for their loan of some rather fabulous shoes. Other backers of the network include HAVC, NFI, SFI, ICAA and the Dutch Film Fund. EWA Network would also like to thank Aurélie Dutrey for her help, Andrew Davidson for his ongoing support, Sybille Zaktreger for her treasury skills and Alexia Muiños Ruiz for her huge contribution to getting the network’s website off the ground. The Sunday evening happy hour event was attended by 300 people – men and women from throughout the industry - including representatives from many film funds (Austria, “the former Yugoslav republic of Macedonia”, Italy, Norway, Serbia, Slovenia, Spain, Sweden, United Kingdom, as well as Eurimages, to name but a few). There were producers, directors, scriptwriters, agents, representatives of networks such as Women in Film & TV India, Birds Eye View UK, Le deuxième regard Paris, Colin Pons from Workstation, Sheffield, Emily Mann from Skillset, Labina Mitevska from Macedonia to name but a few. EWA Network is proud to have brought together so many talented people on one terrace at a busy time in the Cannes calendar. In between events, we met and interviewed romanian director Eva Pervolovici. Check the interview. We also had the chance to talk to Marcela Said, director from Chile with a film, "Summer of the flying fish" in the Quinzaine des realisateurs. 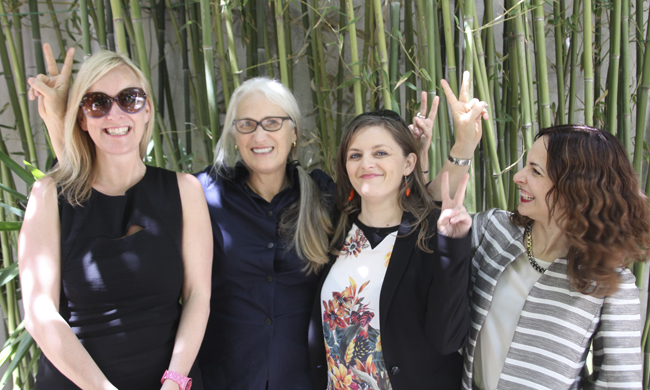 Our Meeting with Jane Campion. Read the whole article here.